I had the biggest craving for polenta the other day. 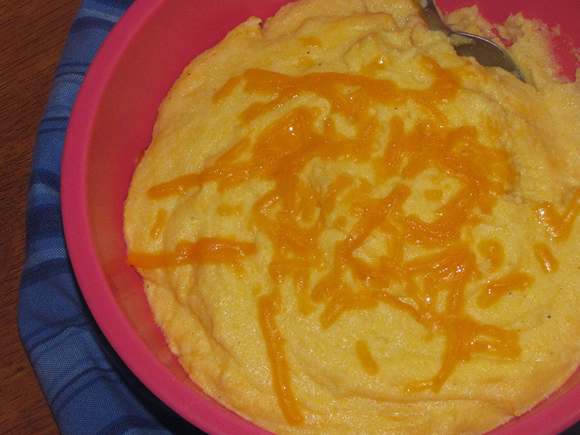 I'm not sure why, but a creamy polenta just sounded so good. We grilled up some steaks so I had my chance! Polenta goes really well with meat and my hubby suggested adding some cheddar cheese to it for a little variation. Why the heck not, right? The cheese was very subtle in flavor but it was enough to hit you a little right at the end of each bite. It was a nice twist on the regular creamed version I've made, too. It comes together really fast and is a great alternative to your standard starchy side dishes. I wanted to add some pepper to this one for a pepper/cheese combo but my little guy was being stubborn. He wanted nothing to do with adding pepper so I decided to leave it out instead of having a ridiculous food argument. Ya gotta pick your battles, right? I'm already thinking about other variations and add-ins. Possibly red pepper? What do you think? I'd love some suggestions in the comments! 1. Bring water, milk and salt to a boil. 2. Whisk in cornmeal and continue stirring for about one minute. 3. Turn heat down to med-low, and let cook for about five minutes, stirring often. Turn heat to low and cook until no longer gritty. Stir in butter. 4. Turn off heat and let sit for a couple minutes. Then stir in cheese and serve.